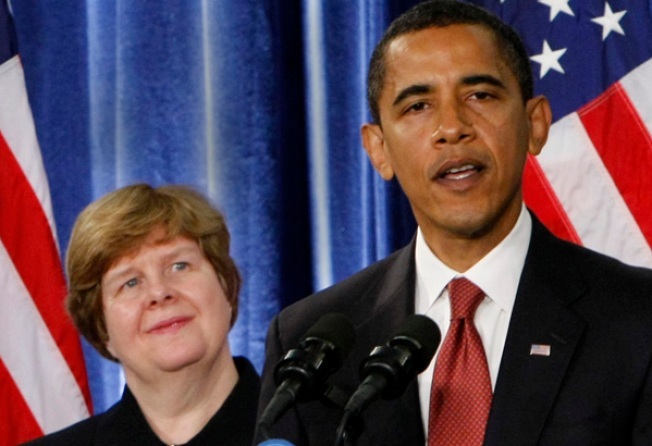 President-elect Barack Obama and Council of Economic Advisers Chair-designate Christina Romer. While we can’t underestimate the challenges we face, we also can’t underestimate our capacity to overcome them – to summon that spirit of determination and optimism that has always defined us, and move forward in a new direction to create new jobs, reform our financial system, and fuel long-term economic growth. We know this won’t be easy, and it won’t happen overnight. We’ll need to bring together the best minds in America to guide us – and that is what I’ve sought to do in assembling my economic team. I’ve sought leaders who could offer both sound judgment and fresh thinking, both a depth of experience and a wealth of bold new ideas – and most of all, who share my fundamental belief that we cannot have a thriving Wall Street while Main Street suffers; that in this country, we rise and fall as one nation, as one people. Having served in senior roles at Treasury, the IMF and the New York Fed, Tim Geithner offers not just extensive experience shaping economic policy and managing financial markets – but an unparalleled understanding of our current economic crisis, in all of its depth, complexity and urgency. Tim will waste no time getting up to speed. He will start his first day on the job with a unique insight into the failures of today’s markets – and a clear vision of the steps we must take to revive them. The reality is that the economic crisis we face is no longer just an American crisis, it is a global crisis – and we will need to reach out to countries around the world to craft a global response. Tim’s extensive international experience makes him uniquely suited for this work. Growing up partly in Africa and having lived and worked throughout Asia; having served as Under Secretary of the Treasury for International Affairs – one of many roles in the international arena; and having studied both Chinese and Japanese, Tim understands the language of today’s international markets in more ways than one. Tim has served with distinction under both Democrats and Republicans and has a long history of working comfortably, and as an honest broker, on both sides of the aisle. With stellar performances and outstanding results at every stage of his career, Tim has earned the confidence and respect of business, financial and community leaders; members of Congress; and political leaders around the world – and I know he will do so once again as America’s next Treasury Secretary, the chief economic spokesman for my Administration. Like Tim, Larry Summers also brings a singular combination of skill, intellect and experience to the role he will play in our Administration. As undersecretary, deputy secretary, and then secretary of the Treasury, Larry helped guide us through several major international financial crises – and was a central architect of the policies that led to the longest economic expansion in American history, with record surpluses, rising family incomes and more than 20 million new jobs. He also championed a range of measures – from tax credits to enhanced lending programs to consumer financial protections – that greatly benefitted middle income families. And as one of the great economic minds of our time, Larry has earned a global reputation for being able to cut to the heart of the most complex and novel policy challenges. With respect to both our current financial crisis, and other pressing economic issues of our time, his thinking, writing and speaking have set the terms of the debate. I am glad he will be by my side, playing the critical role of coordinating my Administration’s economic policy in the White House – and I will rely heavily on his advice as we navigate the uncharted waters of this economic crisis. As one of the foremost experts on economic crises – and how to solve them – my next nominee, Christina Romer, will bring a critically needed perspective to her work as Chair of my Council of Economic Advisors. Christina is both a leading macroeconomist and a leading economic historian, perhaps best known for her work on America’s recovery from the Great Depression and the robust economic expansion that followed. Since 2003, she has been co-director of the National Bureau of Economic Research Monetary Economics program. She is also a member of the Bureau’s Business Cycle Dating Committee – the body charged with officially determining when a recession has started and ended – experience which will serve her well as she advises me on our current economic challenges. Christina has also done groundbreaking research on many of the topics our Administration will confront – from tax policy to fighting recessions. And her clear-eyed, independent analyses have received praise from both conservative and liberal thinkers alike. I look forward to her wise counsel in the White House. Finally, we know that rebuilding our economy will require action on a wide array of policy matters – from education and health care to energy and Social Security. Without sound policies in these areas, we can neither enjoy sustained economic growth nor realize our full potential as a people. So I am pleased that Melody Barnes, one of the most respected policy experts in America, will be serving as Director of my Domestic Policy Council – and that she will be working hand-in-hand with my economic policy team to chart a course to economic recovery. An integral part of that course will be health care reform – and she will work closely with my Secretary of Health and Human Services on that issue. As Executive Vice President for Policy at the Center for American Progress, Melody directed a network of policy experts dedicated to finding solutions for struggling middle class families. She also served as Chief Counsel to the great Senator Ted Kennedy on the Senate Judiciary Committee, working on issues ranging from crime to immigration to bankruptcy, and fighting tirelessly to protect civil rights, women’s rights and religious freedom. Melody’s brilliant legal mind – and her long experience working to secure the liberties on which this nation was founded and secure opportunity for those left behind – make her a perfect fit for DPC Director. I am grateful that Tim, Larry, Christina and Melody have accepted my nomination, and I look forward to working closely with them in the months ahead. And that work starts today, because the truth is, we don’t have a minute to waste. Right now, our economy is trapped in a vicious cycle: the turmoil on Wall Street means a new round of belt-tightening for families and businesses on Main Street – and as folks produce less and consume less, that just deepens the problems in our financial markets. These extraordinary stresses on our financial system require extraordinary policy responses. And my Administration will honor the public commitments made by the current Administration to address this crisis. Further, beyond any immediate actions we may take, we need a recovery plan for both Wall Street and Main Street – a plan that stabilizes our financial system and gets credit flowing again, while at the same time addressing our growing foreclosure crisis, helping our struggling auto industry, and creating and saving 2.5 million jobs – jobs rebuilding our crumbling roads and bridges, modernizing our schools, and creating the clean energy infrastructure of the twenty-first century. Because at this moment, we must both restore confidence in our markets – and restore the confidence of middle class families, who find themselves working harder, earning less, and falling further and further behind. With our economy in distress, we cannot hesitate or delay. Our families cannot afford to keep on waiting and hoping for a solution. They cannot afford to watch another month of unpaid bills pile up, another semester of tuition slip out of reach, another month where instead of saving for retirement, they’re dipping into their savings just to get by. Again, this won’t be easy. There are no shortcuts or quick fixes to this crisis, which has been many years in the making – and the economy is likely to get worse before it gets better. Full recovery won’t happen immediately. And to make the investments we need, we’ll have to scour our federal budget, line-by-line, and make meaningful cuts and sacrifices as well – something I’ll be discussing further tomorrow. Despite all of this, I am hopeful about the future. I have full confidence in the wisdom and ingenuity of my economic team – and in the hard work, courage and sacrifice of the American people. And most of all, I believe deeply in the resilient spirit of this nation. I know we can work our way out of this crisis because we’ve done it before. And I know we will succeed once again if we put aside partisanship and politics and work together, and that is exactly what I intend to do as President. Thank you, and I’m now happy to take questions.